Posted February 8, 2016 by mdevries & filed under MDV Blog. 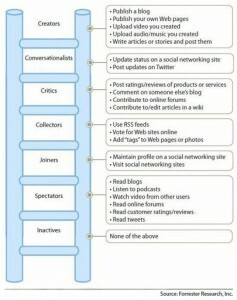 Anyone working in social media needs to know the social technographics of their target audience. 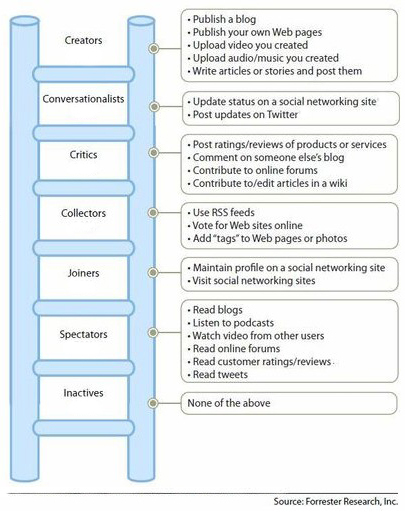 Below is an easy chart from Forrester Research that shows who does what in social media. So for example, if your marketing target is a Creator, make sure your campaigns provide elements that can be used by your target marketing to create their own content. If your target is a Spectator, make sure there is a lot of content to read and understand so they can become an expert.